ปราชญ์หลายท่าน เช่น อาจารย์ชลูด นิ่มเสมอ ท่านเคยเขียนไว้ว่า "การเป็นศิลปินที่ดีนั้นเป็นได้ง่าย แต่การเป็นทั้งครูและศิลปินที่ดี เป็นได้ยาก เพราะศิลปินที่ดีเขียนรูปอย่างเดียวได้ แต่ครูต้องสอนและเขียนรูปให้ดีด้วย มิฉะนั้นศิษย์จะไม่ศรัทธา"
การอยู่ในวงการศิลปะนั้นไม่ใช่ของง่าย เพราะทุกวงการมีทั้งคนดีและไม่ดี พอเริ่มเด่นดังก็มีบางคนเขม่น ริษยา บางคนเคยสนับสนุนก็กลับเหินห่าง การทำงานเป็นกลุ่มใหญ่หลายครั้ง เขาเป็นฟันเฟืองตัวหนึ่ง ต้องรับภาระทุกอย่าง ต้องเป็นประหนึ่งหนังหน้าไฟ รับหน้าทุกเรื่อง เพราะศิลปินต่างมีตัวตน มีอัตตาสูง เขาต้องเป็นคนประสานงาน เป็นตัวกลางที่ต้องถูกกระทบ บางครั้งก็มีเสียงเสียดสีนินทา จนบางครั้งรู้สึกระทดท้อ เขาพยายามมองให้เป็นเรื่องธรรมดา เขาเล่าว่าเมื่อเกิดภาวะเช่นนี้ เขาจะไม่โกรธ ไม่เกลียดคนที่มีอคติต่อเขา เพราะหากคนเหล่านั้นรู้จักตัวตนที่แท้จริงของเขาแล้วก็จะไม่เกลียดเขาเลย "นักรบเก่งต้องมีบาดแผลบ้าง หากต้องการได้รับชัยชนะอย่างสง่างาม" ด้วยจิตใจอันเข้มแข็งและรู้จักให้อภัยนี้ จึงทำให้เขายังอยู่ในวงการต่อไปได้เป็นอย่างดี เขาย้ำว่า "สังคมใดก็แล้วแต่ มีความไม่จริงใจซ่อนอยู่ การนินทาเป็นเรื่องธรรมดา มีอยู่ทั่วไปทุกวงการ แต่เมื่อ งานส่งผล คนจะเข้าใจและเห็นใจในความมุ่งมั่น" เหล่านี้เป็นบทพิสูจน์ตัวตนและการทำงานของศิลปิน เขารักที่จะทำงานแบบสันโดษ แสดงไป ทำงานไปดีกว่าที่จะไปหวั่นไหวกับความเป็น "ธรรมดา"
In the present era where materialism is overwhelming, many have forgotten to realise what true Buddhism really is. Some have become the economic slaves of brand names while others diligently work for the hard-earned money but spend it extravagantly. We are never tired of struggling through it all to earn some money, even to go as far as cheating or backstabbing others for our own good. However, some artists think that Buddha-Arts might be able to remind of what Buddhism is about and what true happiness really is. That brings about the name of Mr. Suwat Saenkattiyarat, an artist who have had faith in Buddhism since young and would like to apply the religious teachings to the people to calm the calamity and needless desires in our minds. Professor Suwat Saenkattiyarat has a carpenter blood flowing in his veins, or what the Northern people call "Sala". His grandfather was the famous carpenter who had built a number of temples in Umper Phan. He wished for his grandson to carry the family trait of carpentering and so he had allowed his grandson to work on what a child could do such as oiling the prototype and simple sculpturing the Thai drawing style such as "Pud-than flower" , "RakRoy" and "Pra-Jam-Yam". He gave his grandson a daily allowance of 2 Baht (which means about 80 baht today). Mr. Suwat Saenkattiyarat grew up with the love of carpentering and later learned technical skills at school. During school vacations, he would always help his grandfather no longer as a general helper but as the prime technician. He was given the opportunity to start the Thai drawing style on the Na-Ban and various Temple gate and was paid thousands of baht every vacation, which was enough to cover his tuition fees and personal expenses at school. He knew that his grandfather paid more that what he should get as the latter knew that the expenses of studying in Bangkok were high. His grandfather truly loved arts and would like to pass on his knowledge 'from generation to generation'. He has become a monk for years and has announced that he wished to die as a monk. Today, he still continues to create more art works for the temple, like building pagoda as well as other beautiful architectures in the temple. He is considered the architect of the Lanna culture while his son, Mr. Suwat�s father, is the merchant who owns the biggest grocery store in Umper Phan market. He creates art pieces and played local instruments as a hobby. He plays "Zung" (Typical Thai musical instrument) really well and distinguished his instrument from others by sculpturing it beautifully by his own hands. All those unusually artistic surroundings has made the young Suwat to be extraordinary. He has shown us that talent through his works of arts. Besides instrument sculpturing, his father also likes to create rose-shaped sculptures and to draw pictures on white-grey paper. Though he had never studied arts, being in monk hood for a few years made him able to remember some artistic wall graffiti so that he could create his own later at home. All those have inspired Mr. Suwat to follow the paths of his father and grandfather. So he chose to go to Bangkok to study arts. Mr. Suwat's father wanted his son to work as anything but an artist, even though he has been witness seeing a successful artist himself. He thought that being a doctor or a policeman offered more secure future and it would also bring fame to the family, or at least being a merchant would be good enough, so that he could continue the family business. When Mr. Suwat opted to study arts at a polytechnic, his father allowed him to do so with his support. However, when Mr. Suwat wanted to further his arts degree at university level, his father rejected the thought. He wanted his son to continue with the family business while studying other things. Mr. Suwat insisted on studying arts and he left for Bangkok, and he sold away his late mother�s beloved necklace and also his first motorbike which was his pride from working with his grandfather. 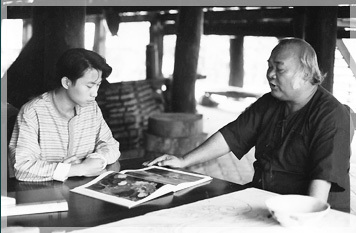 He met Mr. Yordchai Chalongkitjsakul, the person who sparked his ambition of becoming an artist. Bangkok was a completely different place from his hometown. He tried hard to find the venues of the various university entrance examinations but he failed more often than not. Precious time was spent and he almost depleted all his cash that he brought along. 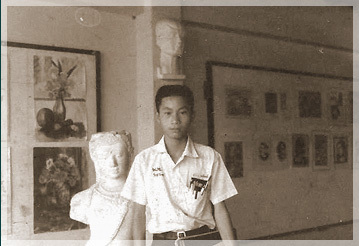 Fortunately, he managed to pass a direct admission to Poh Chang College of Arts & Crafts where he was taught by Mr. Sompong Akarawong and Mr. Soodsakorn Chaisem. With solid foundation from his teachers, and his own endless hard work, he had outperformed other students. He tried hard to create his own style of arts which his teachers sometimes disagreed but they certainly appreciated Mr. Suwat�s creativity. After graduating with a diploma, he furthered his studies majored in arts education at Rajamangala Institute of Technology (now Rajamangala University of Technology, Thanyaburi) where he met a lot of great teachers. Back when he was young, Mr. Suwat often dreamt to become an arts teacher one day. 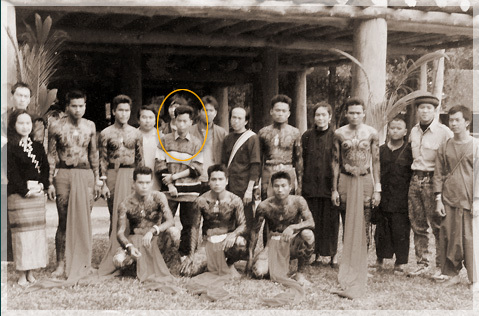 He studied at Matthayom Phanwittayakom School (high school equivalent). The reason was he truly respected his arts teacher in high school, Mr. Kaew Janthakras, who was an arts graduate from Silpakorn University. Mr. Kaew is an example of excellent teachers who truly care for their students. He pushed some of his students hard if he saw talent in them. He even gave extra lessons free of charge on weekends so his students could learn more. His wife, Mrs. Ladda Janthakras, was a respectable teacher at the same school and always supported her husband�s charitable tasks. At the first arts competition Mr. suwat ever participated in, he won the First Price of 3,000 baht from The Communications Authority of Thailand which was considered really much for that time. That truly emboldened his passion in arts. His friends often called him "the Leader (in arts)." Mr. Kaew also went as far as to send Mr. Suwat's paint to Turkey with his own financial support. Teacher Kaew's generosity is well-known and he received the honourable provincial Good Man Award and was seen on TV in Channel 5. His story was also published in "Good Story of Good Man" with the support of the government to show the society how incredibly generous and kind a person can be. A great teacher certainly is an excellent example for his students to follow. Mr. Suwat has always had an ambition to become a teacher because he had such a great teacher as the mentor and wanted to become someone like him. After graduation from university, many people encouraged him to give up being a teacher and to become a full-time artist. However, Mr. Suwat still adheres to his ideology of becoming a great teacher like Mr. Kaew so that later generations will still benefit from his knowledge which is passed on to his students. He believed being a teacher is the greatest occupation. He met up with some famous artists in various places, especially Chiang Rai, and he had lots of opportunities to learn new things. When the Royal Princess Maha Chakri Sirindhorn visited Rai Mae Fah Luang, he had to paint tattoo on a soldier�s body (called "Sattaboriphan" : The tattoo drawing of 7-mountain). Whilst he was still a student, other painters were already very experienced teachers. Being close with them and being able to exchange their skills and styles made him able to be very knowledgeable and highly skilled later. Ajarn Thawala was a leader artist in that team. Even while Mr. Suwat was still an undergraduate student, meeting many older talented artists taught him many things which he never knew. Also, he was very willing to learn things our of his own major and so he went to look for Teacher Thawan Datchani. He spelled the teacher's name wrongly in the letter written to him and was given a lines-writing as a punishment! on the meeting day. Ajarn Thawala was a true master and taught him many, many things. He showed him about how lines and colours make arts work. He also brought him to various places where hundreds of paintings were studied at night. She once said "I would only teach those who are truly willing to learn or else it's just another waste of my saliva." At another occasion, he went to Ajarn Pratueng Emcharoen who was a master in transforming bright and powerful colours into something of cooler tones, but with complete array of colours. Mr. Suwat learned a lot of new things and he tried time and again to create his own style. His painting, which was submitted for a competition after meeting Mr. Pratueng, actually received an honour from His Majesty to be placed at the provincial principal office at Sri Saket. The search for knowledge did not stop with just two teachers, of course. Mr. Suwat learned dynamics of lines from Mr. Angkarn Kallayanaphong who always taught him to be up-to-date and keep improving our own selves based on past experiences. Mr. Suwat also met Ajarn Bamrung Kongsook who taught him about the condition & philosophy of Thai Art from his long experiences. Latest he met Ajarn Chaloemchai Kositphiphat who prominently contributed and made known of the Thai Art to the society. Ajarn Chaloemchai always told him to take pride in being an artist, to believe in our own Thai heritage and not to succumb to foreign cultures nor arts galleries' money. Meeting up with various great teachers has strengthened his dream to become a teacher for the next generations. Also, he believed that artistry is the honour of life. Back to the time right after he was taught by Ajarn Thawala, he was still an undergraduate student and painted "Kuramawatarn" then he submitted that for Bualuang Arts Competition, which is the most prestigious award, and was awarded the Bronze Medal. Certainly, the judges were fascinated by his painting, which proved his uniqueness and talent in arts. Mr. Suwat graduated with a top rank of his class and after a few years of being full-time artist, he passed through teachers' test and became a teacher at Rajamangala University of Technology, Thanyaburi.With constant desire to learn more, Mr. Suwat studied for a masters' degree at SrinakharinWirot University, Prasanmitre. 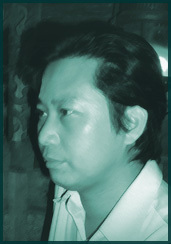 With the help of Ajarn Pratueng, he created his own whole new modern Thai arts style. After many trials and errors, he took part in Bualuang competition again with his "The Miracle of Lokawiworana". This time, he achieved the highest award achievable, the Gold Medal Award. He utilised spaces in the paint intelligently with warm earth-toned colours like grey, reflecting from his inner understanding of the truth in "Wattasongsarn" from the pass-away of his mother and grandmother. Upon achieving the highest award for a Thai culture artist, Mr. Suwat decided to become a monk atWat Chonlapratanrangsarit for a year. He was determined to truly comprehend and follow the Buddha's teachings. Through deep understanding of Buddhism, he wished to show it to people through his arts. The life of an artist who is also a teacher like Mr. Suwat used to bring him difficulties in life. As he became a prominent artist, he had to spend more and time on painting and sometimes it was conflict to the role as a teacher which is time consuming to pursue the class and follow some rule of the faculty. Many famous artists suggested that he should quite as a teacher. He almost gave up. However, he remembered Ajarn Kaew's teaching that "as a teacher and artist, not only should we create beautiful arts, but also create successful students like ourselves." Many students insisted that he should continue to teach as they felt that Mr. Suwat was such an excellent teacher and their lives would change without his guidance. Also, a guru named Ajarn Chalood Nimsamer reminded him that being a good teacher and a good artist at the same time is difficult because he had not only create a great art pieces but also have to gain the respect by the students. After learning better time management, Mr. Suwat continued being an arts teacher and an artist. Despite earning much more from selling his paintings than his own salary, he still loved to teach, like he has dreamt to do. Today, being in the field of arts is not easy as there are both good and bad people in the society. When Mr. Suwat became famous, it was only natural that he would have to face others' jealousy. Due to high ego of many artists, badmouthing has become something Mr. Suwat had to get used to. He was never angry with those petty words, and was never upset by them. He always thought that a true warrior certainly must have some wounds before he wins the war. 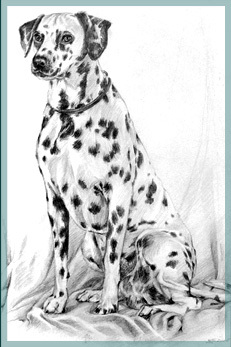 With unwavering determination and selflessness, he continued to grow as an artist. 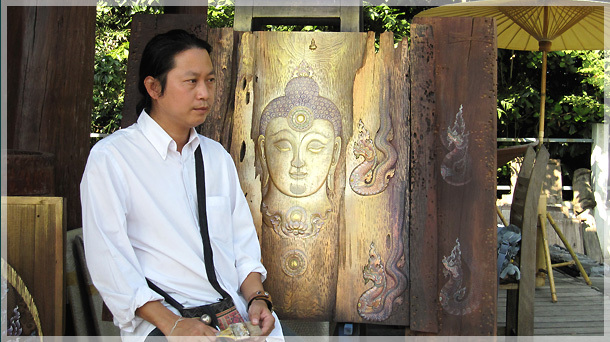 Mr. Suwat first showcased his artistic paintings at "Buddha-Arts in Imagination" at Ahimsa Arts Centre in 1994. It was a very successful event and he gave all the proceeds from the exhibition to his father to show him "The pride prestigious of bring an artist". 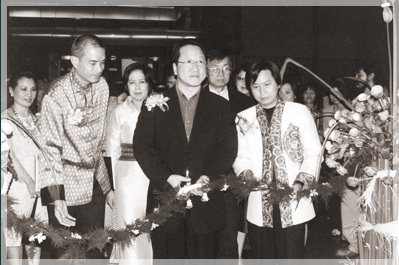 The second showcase in 2002, "Appreciation of the Soul", was highly successful again and he donated the proceeds to renovation of Arts Centre at Panyanandaram Temple. Later, with the teaching of the great 5 teachers, he added sculpturing into his Thai arts and his arts improved to even greater level. With additional supervision from Ajarn Bamroongsak Kongsook, the guru of Buddhist heritage, he was both a teacher and a friend of Mr. Suwat's and based on this improvement, he held the third exhibition of his arts "Buddha Philosophy - The Power of Buddha" in 2003 which he spent 2 years in preparation. It was even more successful than the first two and collectors and reporters flocked to the exhibition to purchase his pieces and to publish stories about himself and his arts. 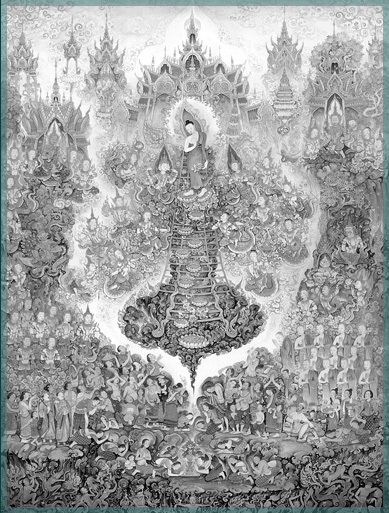 This year, the Arts Exhibition of Thamma-Prachaya and the Power of Deva 2007, aims to present to the audience two themes, namely: the core of Buddhism; and the superstitious miracles of the angels and gods of Brahma. 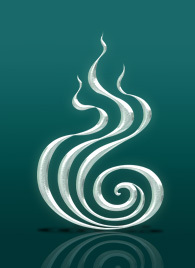 The beliefs were based from India and passed down to Thai people through our ancestors. Buddhism teaches us to do good deeds so good things will happen as a result, while Brahma teaches people to pay proper respect to the various gods and angels so that good things will happen as well. 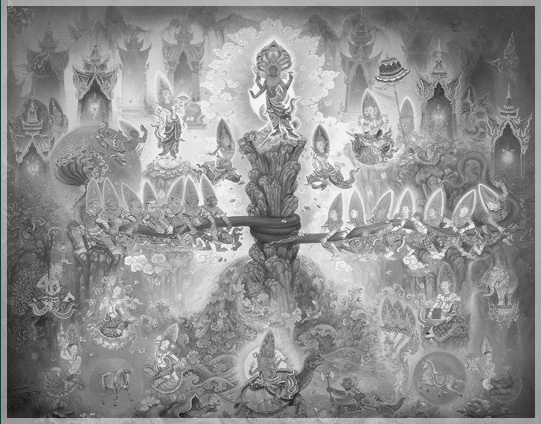 The combination between superficial superstition and deep understanding of things of the two religions certainly leads Mr. Suwat to create such a unique art that will transcend the religious faiths to the audience. This exhibition will showcase Mr. Suwat's skills in not only painting, but also wood sculpturing and Lanna cultures (Northern Culture). The style will be of "high relief". Throughout the long time Mr. Suwat has lived with arts and so much effort has been put into his arts, he has certainly faced some failures, but most of the time he was successful and achieved highly praised awards. Three of his creations are kept at the Office of the National Museum, Hor-Silpa were his greatest pride of life. The three paintings are: "Phra Preecha samart Rart Rom-Yen"; "The Miracle of Pair No.2"; and the 3rd painting titled "Buddhanu Sati". Achieving such an honour certainly inspires the young artist further to be one of the greatest artist and teacher in the kingdom. Currently, he had am opportunity to design and supervise the construction of the gate for the "Wihara", the place to establish The Sleeping Buddha at Wat Phaphugorn at Udonthani province.This 'Phra non pang Parinippan' is designed and sculptured by Ajarn Naris Rattanawimol on the marvellous Italian White Carara granite. Then 'Phra Lokuttara' designed and created by Ajarn Chaloemchai Kositphiphat and the 'Thosa Bharamee' picture is under the control of Ajarn Bamroongsak Kongsook. The four are indeed ones of the greatest artists in this era. The one who asked him to do the above mentioned job was Mother Piyawan Weerawan. He was very touched by her kindness and her willingness to pass on her knowledge to him. It was his birthday when she requested for him to make the temple gate. It was miraculous in the sense that he was paying respect and offering meals to monks and prayed for his birthday wish that he wanted a job related to Buddhism. It was as if a dream has come true on that very same day. The gate creation project therefore became his greatest birthday present ever. In order to raise the funds for the project, he allowed the licensed printings of 10 of his paintings to be sold to faithful Buddhists and people. The money earned through the fund-raising would also be used to build a Buddha statue. Mr. Suwat worked on the project with happiness and without any pressure and with the support of Mother Piyawan who once told him, 'Whenever you face any opportunities in life, grab it and always put in your best effort to do it flawlessly. Only being able to do that would make you feel that your have truly achieved something". Not only that, Mr. Suwat found that he could really trust his team-mates and they also believed in Mr. Suwat's ability. 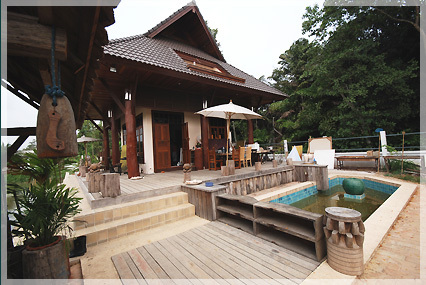 Today, Mr. Suwat has his own arts gallery titled "Ruensilp Sankattiyarat", which is located at 24/6 Moo. 11, Liebkrong Street, Tumbol Nongsamwang, Umper Nongsue, Prathumthani province. Mr. Suwat's path of artist is still endless. He still has various opportunities to do good deeds through both imparting on his knowledge and passing on his religious knowledge and belief to others. Those are not only his own pride but the pride of being a true artist. We have such a wonderful teacher like Mr. Suwat who has both the souls of being a true teacher and of a Buddhist at heart. He is able to impart his knowledge and skills to his students, and to leave behind many of his creations in important historic temples and museums for the later generations. It is very fortunate for us to know that there is still an excellent teacher existing in this world.